The University of Northwestern Ohio is affiliated with a variety of industrial organizations. Maintaining close contact with these industrial organizations aids in UNOH being able to offer the most up-to-date education to its students. 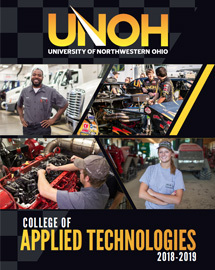 When students graduate from the College of Applied Technologies at UNOH, they can rest assured that they have been trained in the latest technology in their respective fields and will be employable upon graduation. The Association of Diesel Specialists (ADS) is an international organization dedicated to the service of diesel fuel injection and related systems. The University has been affiliated with ADS for many years and is a charter member of the ADS TechSmart program. As a TechSmart member school, we are dedicated to providing skilled, entry-level technicians to the diesel fuel injection industry. Also, University students are eligible for ADS scholarships, and through testing have the opportunity to become ADS certified. The American Trucking Association (ATA) is the national trade association of the trucking industry. The mission of the ATA is to serve the interests of the 9.3 million people and 423,000-plus companies involved in trucking, and to educate public officials at all levels of government about the essential nature of the trucking business. University instructors have joined The Maintenance Council (TMC) of the American Trucking Association (ATA) in order to provide our students with the latest maintenance information available to the trucking industry. ASE, the National Institute for Automotive Service Excellence, is a non-profit organization with a single mission: "To improve the quality of automotive service and repair through the voluntary testing and certification of automotive technicians." The University supports ASE by requiring that all College of Applied Technologies Instructors be ASE certified. The College recommends that students take a minimum of two ASE tests, which can be taken at ASE test sites across the United States. The HVAC/R program at UNOH has been granted the HVAC Excellence Accreditation. HVAC Excellence was established in 1994 to improve the technical competency of the HVACR industry. Programmatic accreditation in the HVACR industry began in 1999, when HVAC Excellence established the national standards. Programmatic accreditation is an independent third party review of an educational program. The process validates that established standards of excellence for HVACR educational programs are met. These standards are designed to ensure that our future workforce receives the quality of training required to provide the skills necessary for success in the HVACR industry. The University’s HVAC/R program is fully accredited by PAHRA, the Partnership for Air-Conditioning, Heating, and Refrigeration Accreditation. PAHRA is an independent, third party organization that is a partnership between heating, ventilation, air-conditioning and refrigeration (HVACR) educators and the HVAC/R industry that awards accreditation to programs that have met and/or exceeded industry validated standards. The University of Northwestern Ohio is one of 54 national training centers in the United States. NAFTC is a national training organization that educates fleet managers, current technicians, and instructors at vocational schools and colleges and students on alternate fuel technology. Statistics show Alternate fuels are the up and coming trend, especially with the rising fuel costs and emissions regulations being placed on vehicle manufacturers. 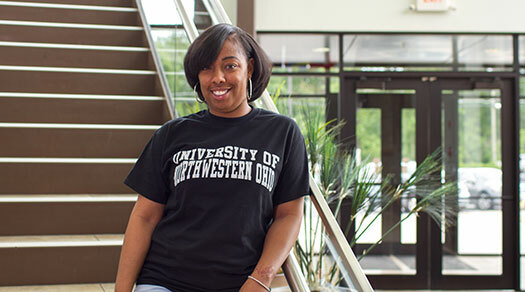 The University of Northwestern Ohio has an Alternate fuels Technician diploma which covers in depth Compressed Natural Gas (CNG), Liquefied Natural Gas (LNG), Propane, Ethanol, Methanol, Hydrogen, Biodiesel, and Hybrid electric vehicles. Also covered in depth are the principles that govern their usage. The NAFTC and the University of Northwestern Ohio work together to promote public awareness of Alternate Fuels, educating the general public on the demand that is being created in the alternate fuels industry. The NATE (North American Technician Excellence) organization is the pinnacle of the HVAC/R field. NATE provides testing to certify the expertise of the technician in the field of their particular professional career. Utilizing its own NATE certified instructors, the college administers these tests on campus. NATEF is an independent, non-profit organization with a single mission: "To evaluate technician training programs against standards developed by the automotive industry and recommend qualifying programs for accreditation by ASE, the National Institute for Automotive Service Excellence." The College of Applied Technologies is master accredited in Automotive, Medium/Heavy Truck, and Alternate Fuels. (RSES) Refrigeration Service Engineers Society is a national organization in the fields of Heating Ventilation Air Conditioning/Refrigeration. The mission of RSES is to educate and update technicians with the latest trends and repair procedures. Also, the organization is the leader in ongoing education for the experienced service technician. Taking the Environmental Protection Agency's (EPA) refrigerant handling exam is one of the benefits of RSES, which is proctored here at The University of Northwestern Ohio, College of Applied Technologies. The Specialty Equipment Market Association (SEMA) members are the producers and marketers of specialty equipment products and services for the automotive aftermarket. The University of Northwestern Ohio is a member of SEMA, and part of SEMA University.